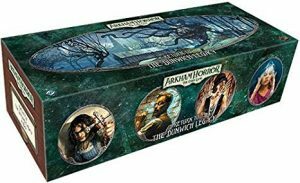 Return to the Dunwich Legacy invites you to re-open your old cases and experience this thrilling campaign with fresh eyes as you encounter new challenges and new surprises. You’ll explore new locations, face more ghastly treacheries, and enhance your investigator’s abilities as you face even more unspeakable terrors. You might of investigated Dunwich once, but this time the evils you encountered before are waiting for you, and they’re more prepared than ever to see their sinister scheming through to the end. In addition to exploring new locations and experiencing surprising bends in the story you thought you remembered, you’ll also face a wealth of terrifying new enemies and wicked treacheries across the new cards provided for each of Return to the Dunwich Legacy’s eight scenarios. You can’t stay away any longer. Despite the danger, despite the looming threat of madness, you must unravel the mysteries of Dunwich. It’s time to brush the dirt off your old cases, gather your things, and board the train to Dunwich once more! Available here.